Australian-American brothers Joel & Luke Smallbone, better known as case-sensitive for KING & COUNTRY have returned with their first album in two years – the punctuation-sensitive Run Wild. Live Free. Love Strong. The time since they released debut album Crave has seen growth and trial for the brothers. Both married, Luke became a father, and Luke also experienced a life-threatening illness that caused him to cling tightly to his eternal hope in Jesus. While these events aren’t mentioned on this album in specific detail, there are themes of love, suffering, doubt, and helplessness weaved throughout the fourteen tracks. Sonically, there’s no doubt about it, this is one big album. The soundscapes on this record are just massive, and are certainly heard best through headphones with the volume cranked. Run Wild… is dripping in electronica, pounding percussion, and stunning harmonies. The album opens up with quasi-title track Run Wild (feat. Andy Mineo). It introduces us to the big sound of the album, particularly in the soaring chorus. The song talks about escaping from the ‘prison of past mistakes’ and this points to Jesus who allows our freedom. Andy Mineo’s verse is brief but powerful, focussing on fears. He mentions our new state as believers, ‘bathed in the blood of a king with the heart of a slave’. Servanthood is a big theme on this album, and this opening track sets the scene for us. The arrangement is rather elaborate, and starts the album at such a massive high that the rest of the album struggles to match it. A short prelude introduces single Fix My Eyes. It’s quite a contrast to Run Wild – shiny, bright pop, complete with handclaps. The song speaks about using our transformed life to serve others, and the motivation comes from fixing our eyes on the ultimate servant – Jesus. Long Live borders on 80s synth territory, and encourages us to make the most of the time we have here on earth. Steady is upbeat, with great electronic bass. Already Home is another hit on Run Wild… that comes full of surprises. Strings and organ open the track but are traded in for electric guitar and a wild groove. Like No Turning Back, the beat and feel of the track keeps restlessly changing. This is Love is a love song underpinned with dubstep. Orchestral sounds hit hard on Matter, a plea to someone to see that they matter to God and that we see this in creation, Jesus’ power, and the cross. Run Wild… closes on a note of beauty with O God Forgive Us. It’s a song of surrender, realising that we try to get by without God but we really need his forgiveness and help. ‘Shallow faith it has left us broke, O God forgive us’. It’s quite a repetitive song, but this actually helps the words sink deep. A massive organ enters and due to the massive sound that this album is built upon, it really doesn’t come as a surprise. And here’s a tip – as the album finishes, keep listening. You’ll discover what the album’s title is all about, if you haven’t already. for KING & COUNTRY have avoided falling into sophomore slump by making an album to the glory of God. Run Wild. Live Free. Love Strong. boasts a soundscape that transports you to another place, with super-tight production. It reminds us of the hope we have in Jesus and our undeniable need for him. I’m giving this one three-and-three-quarters out of five. Run Wild. Live Free. Love Strong. by for KING & COUNTRY will be released on September 16th, and can be pre-ordered now on iTunes. 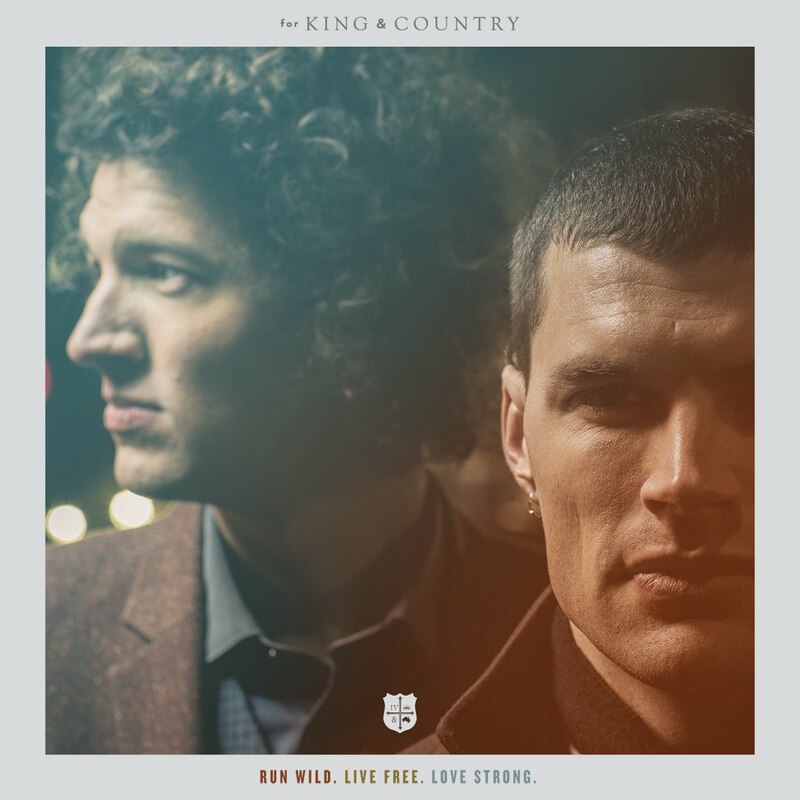 Posted in MusicTagged Album Review, christian, for KING & COUNTRY, Run Wild. Live Free. Love Strong.Bookmark the permalink.